Much of our lives are governed by fate, chance or the hand of God. It is rare when the destinies of a number of groups are brought together through a common medium, changing the lives of all. 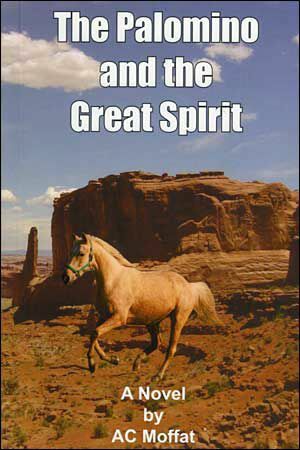 This is the story about four very different groups of people whose lives are brought together — some for the better and some for the worse — by a single Palomino horse. Each group knows its destiny, but struggles against the inevitability of their own future: none foresee how each will be affected by the others — and that is the story! Iron Hand hoped that the golden horse would remain still and calm — as he had seen so many cowboys’ horses do when the riders were dismounted; and as Indian ponies did as well. That would make it much easier — although far less exciting — than when they chased down wild ponies. He advanced slowly… slowly… slowly. A wild look suddenly came into Prince’s eyes; his head raised high and his nostrils flared. Iron Hand was riding a stallion and Prince had immediately sensed the challenge by this new male, so that he reacted by attacking him! Before Iron Hand knew what was happening, Prince had reared up and was madly pawing with his front hooves at Iron Hand’s horse.